So, I hosted a 4th of July shindig and grilled a ton of burger patties, among other things. I did good having prepared just the right amount of food and didn’t have a lot of leftovers in the end. But still, it can’t be perfect, right? There were still a few patties left and I didn’t want them to go to waste so my wife and I had another round of burger sandwiches the next day. But after that, we didn’t feel like having another hamburger for a long while. Now, what to do with the other two patties left in the fridge? Well, I looked it up and found this Hawaiian dish called Loco Moco. It sounded so simple and so… so ghetto!!! LOL! But I was so intrigued that I gave it a go anyways. And let me tell ya, if you like rice dishes, this is a knockout! 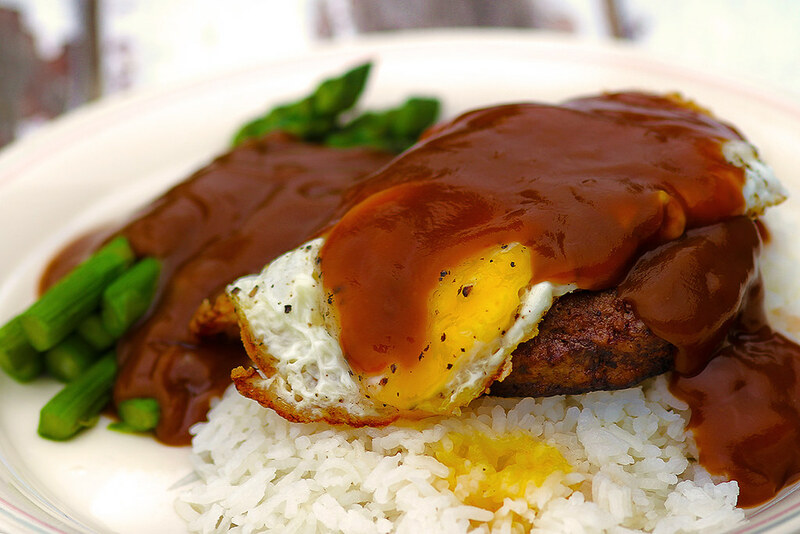 All it is is a bed of steamed white rice topped with a burger patty, a fried egg (or two) and everything smothered with brown gravy. That’s it! I added some asparagus just to say I had my veggies for the day. You have to give it a shot next time you have leftover patties from your backyard BBQ. Here’s a fun dish to make. Really easy, yet still elegant. The only real chore to me is the meat pounding, but it reduces the cooking time tremendously, so it’s worth doing it. Other than that, it’s a great dish to make on a lazy afternoon. The sauce is similar to the one I made using veal. Of course I made little changes. Again… what else is new? I just thought I’d use chicken this time, and then add pasta to make it a complete meal. Also, I’m sure you can use other veggie on the side but the asparagus makes for a great compliment, for some reason. It is also good to note that although it’s fine to use any pasta you wish, I find that thinner strands (capellini, angel hair, thin sphagetti, etc.) work best. I don’t know, something about it being smothered with sauce makes it yummy. So anyway… get cooking, peeps! Slice the chicken breast across to make two thin fillets. Cover each piece with plastic wrap and pound them on a chopping board with a flat headed mallet until they’re thin. Be careful not to pound too hard lest the meat breaks. Pour flour in a wide bowl, season with salt & pepper and whatever dried herbs you have (tarragon, thyme, basil, etc.). Dredge chicken pieces to lightly coat, shake excess flour and pan-fry in a thick bottomed pan with a little olive oil in medium heat. Cook for 3-4 minutes on each side. Don’t overcook! Set aside, cover to keep warm. Meanwhile, boil water in a double boiler for the pasta and asparagus. Chop and discard the thick bottom part of the asparagus pieces, place the rest in the steamer basket and set aside. Now, back in the pan. Add more oil and saute the minced garlic for a minute or so. Add about 3 tbs. of the excess seasoned flour and cook for a couple more minutes. Add a cup of stock to start and stir until bubbly and thickened. Add more stock as needed, until a stew-like consistency is achieved. You don’t want it too thick. Whisk in the butter until melted, then turn the heat off. Mix in the parsley and capers and squirt the juice of 1/2 lemon. Sauce is done! Your water should be boiling by now. Add the thin pasta and some salt then quickly put the steamer basket with the asparagus on top. Close the lid and cook for about 3 minutes. Again, do not overcook! 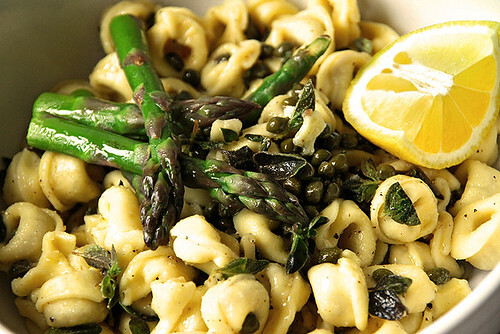 Set aside the asparagus. Drizzle a little EVOO on the pasta and toss to keep from sticking. For plating, twirl some pasta on a plate and smother with sauce. Then place a piece of chicken on top and smother with more sauce. Finally, add some asparagus pieces on top. If you want, you can add a garnish of lemon zest, more parsley and a lemon wedge. Buon appetito! I’ve been eating a ton of fish lately. Not sure what got me on a fish roll but it’s been nice cutting back on the red meat, for sure. I usually get the fillets since they’re obviously easy to prepare. But yesterday, I saw a couple of 1 lb. fresh whole tilapia for a buck and a half each. That’s about 5 times cheaper than the fillet! No brainer, I thought. And it’s one of my favorite variety, to begin with. So anyway, here’s what I prepared tonight. Outstanding! 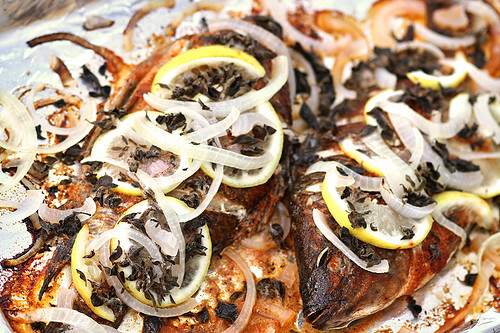 Something about paprika and lemon on fish you can’t go wrong about. Just make sure the fish doesn’t smell fishy. Actually, it shouldn’t smell anything, at all! Really. I stuck my nose and made sure I wasn’t going to regret it later. So good with rice pilaf and a side of steamed veggies! So what are you waiting for? Go get your Omega 3 on, already! Preheat oven to 400F. In a small bowl, combine paprika, garlic and thyme and mix well. Rub mixture all over the fish and lay on a lightly greased (use cooking spray) baking sheet. Sprinkle some salt and pepper and squeeze the juice of half a lemon on both sides. Then tinly slice the other half and cover the top side of the fish with the slices. Spread the onion pieces on top and all around the fish. Spray the entire thing lightly with cooking spray. Cover the tray loosely with aluminum foil and bake in the oven for 40 minutes. Well, it’s a rice bowl and of course, you can put anything in it. This is tonight’s concoction, I guess. I just saw a bag of this so-called heirloom forbidden rice at the store this afternoon. I’ve never had it before and I was curious. Apparently, it’s of Chinese origin so I immediately thought of a quick stir-fry to go with it for dinner tonight. I already have a half-opened box of roasted pistachio nuts at home and knew I wanted to use some of it, as opposed to cashew or whatever. So I just grabbed some scallions, mushrooms and an orange. An orange? I guess I was thinking orange chicken or something like that. I guess we’ll find out. Wow, how refreshing! No meat but quite filling. 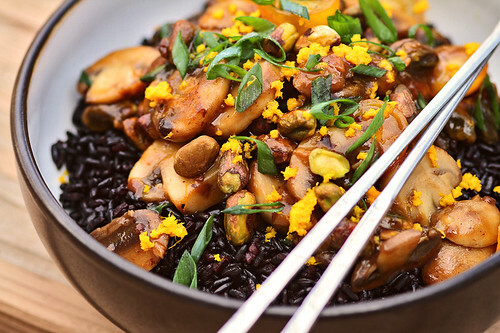 The rice has a nutty personality to it, like brown rice. It’s supposed to be sticky but I only cooked it with 1 part rice and 1 3/4 part liquid instead of the usual 1:2 ratio. So it was leaning more towards al dente. Anyway, good stuff. Cook rice to package direction. When it’s done cooking, leave the lid on for another 30 minutes before digging in. Meanwhile, saute garlic and mushroom with oil in a large pan on medium heat for a couple of minutes. Fold in oyster sauce, tomatoes and pistachio nuts until well combined. Salt and pepper to taste (easy on the salt as the oyster sauce is already quite salty). Turn off the heat and squeeze the juice of an orange. Fluff the rice and scoop in serving bowls. Top with stir-fry. Grate some zest from the orange and sprinkle with scallions to garnish. Enjoy. Wow, it’s been awhile since I last posted something here. And no, I haven’t been fasting either. Just got a bit preoccupied with stuff, I suppose. Anyhow, that’s my excuse. And this is what I had for dinner tonight. Nothing fancy, just another concoction from this week’s leftovers in the fridge. I had gotten this one dollar bag of dried tortellini from the discount store and thought, why not. I was looking at the ingredients and amazingly, there was nothing I couldn’t read. All natural ingredients for a buck? I must give it a try, at least. Turned out to be better than I thought. 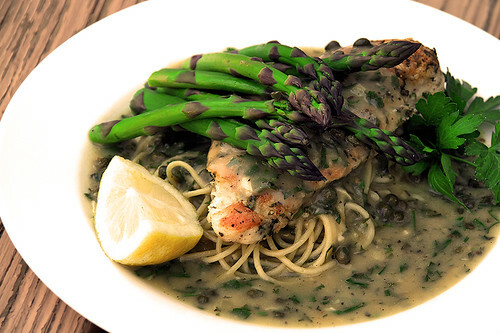 Just a little herb action and it’s a fantastic, fresh and healthy dinner, in no time at all. Cook tortellini to al dente. Meanwhile, saute garlic with a little EVOO in a medium-low heated pan for a few minutes until lightly brown and fragrant. When tortellini is done, drain and transfer to the pan with the garlic and turn off the flame. Add thyme, capers and season with salt and pepper. toss well to combine. Transfer to serving plate and squirt the juice of half a lemon. Finish with a drizzle of fresh EVOO and a sprinkle of parmesan. Serve with a wedge of lemon and a side of veggies. I’ve never had trottole before so I thought I’d give it a whirl to see how it is, texture-wise. It looks like a really long macaroni and it feels like you’re eating just that. Strange, but yummy. In other words, I’m an instant fan. And it’s pretty obvious that spinach is my go-to vegetable. I eat it more than any other veggie in existence. Yet, believe it or not, I’ve never had spinach pesto either. About time I made some. And dagnabit! I am impressed! Wow! I vow to make it again here very soon. Cook pasta to al dente. Meanwhile, put all the pesto ingredients, except for the EVOO, in a food processor. Slowly pour in the EVOO while lightly pulsing the machine until you have a creamy mixture. 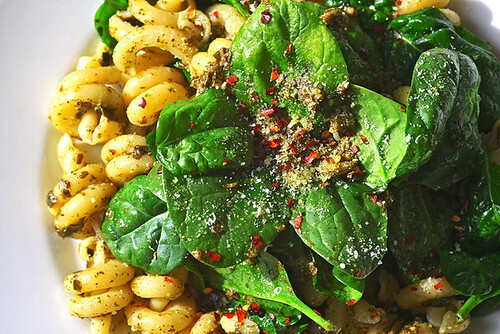 Blend pasta with pesto in a large bowl. Mix in the other cup of spinach and sprinkle with red pepper flakes, if you want. This one was inspired by a recipe from Cook’s Country. 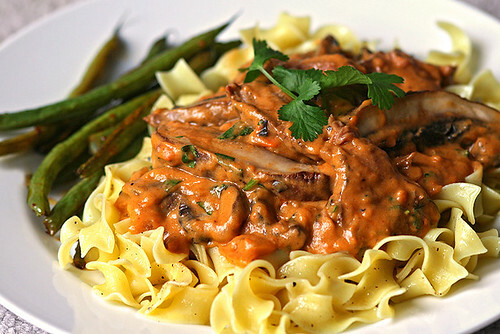 I took their low-fat beef stroganoff on a different spin by taking out the beef altogether. Alright, the truth is I accidentally used the meat for something else, ok? Actually, by having just the portobello mushrooms, it now felt even lighter. Also, I thought the idea of using yogurt instead of sour cream was interesting. Great for slashing the calories, for sure. Fortunately, with the tomato paste and mustard, it still retained quite a bit of tang, but not too much. Which I liked a lot, actually. You’ll love the down home taste of this recipe. Give it a try. Definitely a cut above the commercial variety. Oh, and feel free to add the meat. Not gonna hurt my feelings, I promise. Brush portobellos with a little EVOO and sprinkle with salt & pepper. Grill or roast to preferred doneness. Slice into long, thin pieces. Set aside. Now, in a medium-heated large skillet, cook onions until browned, 6 to 8 minutes. Stir in flour, salt and tomato paste and cook until paste begins to darken, about 2 minutes. Add broth and mustard and bring to a boil while stirring, making sure there are no lumps. Reduce heat to medium-low and simmer until sauce is slightly thickened, about 5 minutes. Meanwhile, Whisk the yogurt and egg white in a bowl until smooth. Add in sliced mushrooms to the skillet and mix to combine well with the sauce. Turn off heat then stir in yogurt mixture and parsley. Season with salt and pepper to taste. Serve with a side of your favorite veggies.